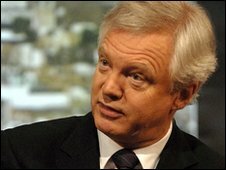 Green campaigners must end a "ferocious determination to impose hair-shirt policies" to fight global warming, senior Tory MP David Davis has warned. The former shadow home secretary criticised higher taxes on flights and the building of wind farms which "look like props from War of the Worlds". There must be a "middle way", including more use of nuclear power, Mr Davis wrote in the Independent. The comments come ahead of the UN Copenhagen climate change summit. Starting next Monday, delegations from 192 countries will hold two weeks of talks aimed at reducing global carbon emissions. Mr Davis said previous climate summits, at Rio de Janeiro in 1992 and Kyoto in 1997, had both promised greater cuts, adding: "Neither happened." He said evidence suggested the earth was cooling, not warming, and that recently leaked e-mails had shown leading scientists "conspiring to rig the figures to support their theories". "So it is unsurprising that more than half the public no longer believe in global warming." Mr Davis also said: "The UK's environmental policy has a long-term price tag of about £55bn, before taking into account the impact on economic growth. "The fixation of the green movement with setting ever tougher targets is a policy destined to collapse. "The ferocious determination to impose hair-shirt policies on the public - taxes on holiday flights, or covering our beautiful countryside with wind turbines that look like props from War of the Worlds - would cause a reaction in any democratic country. "This adverse reaction will be reinforced if, as predicted, we suffer power shortages in the next decade. "Lights going out around Britain could be an electoral off-switch for environmental policy. This will happen at the same time as fuel bills rise by 30%." Mr Davis, who lost to David Cameron in the 2005 race for the Tory leadership, said a "major increase" in nuclear power was needed, as it was a "true zero-carbon option". The government and the Conservatives back a policy of cutting the UK's carbon emissions by 80% from their 1990 levels by 2050. The UK's Climate Change Act, passed last year, makes this a legal requirement. Both parties also back an expansion of nuclear power, with the government recently approving 10 potential sites in England and Wales on which to build new generators.